TravStar1 Point Of Sale SystemManager's Work Station Bar Code PrintingHow Do I Add the Stuff Labels Button? How Do I Add the Stuff Labels Button? This lesson will teach you how to add the Stuff Labels button. Click on the Misc User Menu tab. From the Misc User Menu tab, click on the "Edit User Menu"button. From the Edit User Menu screen, click on the "Add" button. Click inside the bubble beside Other Executables. Then click on the "OK" button. (1) Type "Stuff Labels" into the Name field. 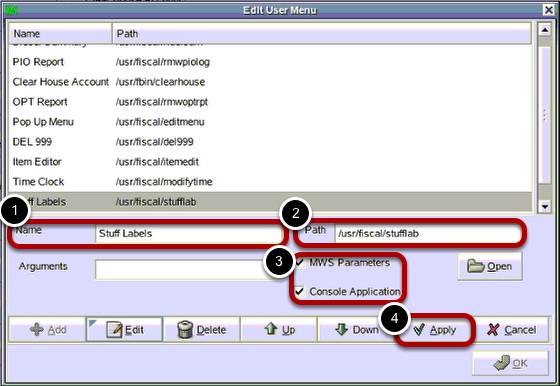 (2) Type "/usr/fiscal/stufflab" into the Path field. 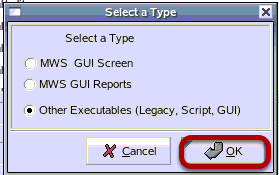 (3) Click the check box beside MWS Parameters and Console Application. (4) Click on the "Apply" button. Prev: How Do I Add the Zap Labels Button? Next: How Do I Run the Red Flag Report? 1.1 How Do I Login to the Manager's Work Station? 1.2 How Do I Navigate the Manager's Work Station? 2.1 How Do I Setup a Cashier? 2.2 How Do I Edit an Existing Cashier? 2.3 How Do I Setup an Employee? 2.4 How Do I Add a New Department? 2.5 How Do I Add a New Department Group? 2.6 How Do I Send Departments to the Register? 2.7 How Do I Change the Manager's Override Code? 3.1 How Do I Close the Day on the Manager's Work Station? 3.2 How Do I Run a Department and Inventory Sales Report? 3.3 How Do I Run a Shift Report? 3.4 How Do I Run the Media Detail Report? 3.5 How Do I Declare Cashier Tills? 3.6 How Do I Run the Store Reconciliation? 3.7 How Do I Run an End of Day on the Manager's Work Station? 3.8 How Do I Run the Price Change Report? 3.9 How Do I Backup the Manager's Work Station? 4.1 How Do I Check and Correct Communication Issues between the Manager's Workstation and the Register? 4.2 How Do I Require Cashier Password on Specific Register Functions? 4.3 How Do I Change the Tax Rate? 4.4 How Do I Assign a Tax Rate to a Group Of Items? 4.5 How Do I Change the Information on POS Receipts? 4.6 How Do I Setup and Send Commands to the Register? 4.7 How Do I Add a Bad Check Customer? 4.8 How Do I Remove a Bad Check Customer? 4.9 How Do I Setup a Percentage Discount? 4.10 How Do I Create a Menu File? 5.1 How Do I Restart the Manager's Work Station? 5.2 How Do I Run End of Month? 5.3 How Do I Run End of Year? 6.1 How Do I Control Access to the Managers Workstation? 6.2 How Do I Change the Password on the Manager's Work Station? 6.3 How Do I Create a Manager's Work Station Login for Cashier's to Declare Tills? 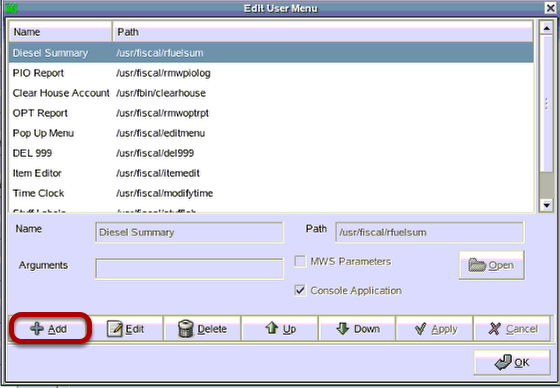 6.4 How Do I Change the MWS Admin Utility Password? 7.1 How Do I Add a New Item into Inventory? 7.2 How Do I Edit an Existing Item? 7.3 How Do I Change the Retail Price for an Existing Item? 7.4 How Do I Assign an Item to a Different Department? 7.5 How Do I Setup Packs and Cartons? 7.6 How Do I Make Changes to Large Groups of Items? 7.7 How Do I Run a Report to See Current Settings on a Group of Items? 8.1 How Do I Setup a 'Buy One, Get One Free' Discount? 8.2 How Do I Setup a Price Discount? 8.3 How Do I Setup a Quantity Discount? 8.4 How Do I Setup a Mixed Price Quantity Discount? 8.5 How Do I Send Mix Match Files to the Register? 8.6 How Do I Apply a Mix Match Code to a Single Item? 8.7 How Do I Apply a Mix Match Code to Multiple Items? 8.8 How Do I Set Up a Buydown? 8.9 How Do I Apply a Buydown ID Tto a Single Item? 8.10 How Do I Apply a Buydown ID to Multiple Items? 8.11 How Do I Setup a Sale to Start on a Specific Date? 8.12 How Do I Setup a Mix Match to Start on a Specific Date? 8.13 How Do I Setup a Price Change to Start on a Specific Date? 8.14 How Do I Edit a Sale and Price Bulletin? 8.15 How Do I Edit the Items in a Sale and Price Bulletin? 9.1 How Do I Setup a New Vendor? 9.2 How Do I Receive a Vendor Invoice Manually? 9.3 How Do I Receive a Vendor Invoice With a Wireless Handheld Scanner? 9.4 How Do I Inventory the Store Without a Wireless Handheld Scanner? 9.5 How Do I Inventory the Store with a Wireless Handheld Scanner? 9.6 How Can I Make Inventory Adjustments without Receiving or Performing a Physical Inventory? 9.7 How Do I Place an Order by Weeks of Desired Inventory? 9.8 How Do I Place an Order by Min and Max? 9.9 How Do I Place an Order for a Vendor Manually? 9.10 How Do I Turn an Existing Purchase Order into an Invoice? 9.11 What Vendors can be Received Electronically? 9.12 How Do I Setup a Vendor for EDI? 9.13 How Do I Receive an EDI Invoice? 10.1 How Do I Add a House Account? 10.2 How Do I Edit an Existing House Account? 10.3 How Do I Delete a House Account? 10.4 How Do I Setup a Fuel Discount for House Accounts? 10.5 How Do I Look Up House Account Transaction Details? 10.6 How Do I Make a Payment on a House Account? 10.7 How Do I Make a Payment on a House Account to One Invoice? 10.8 How Do I Make a Payment on a House Account to All Charges within a Date Range? 10.9 How Do I Make a Payment on a House Account for a Specific Amount? 10.10 How Do I Add an Invoice to a House Account? 10.11 How Do I Add a Credit to a House Account? 10.12 How Do I Run Customer Statements? 10.13 How Do I Send House Accounts (Customers) to the Register? 11.1 How Do I Print Barcodes? 11.2 How Do I Add the Zap Labels Button? 11.3 How Do I Add the Stuff Labels Button? 12.1 How Do I Run the Red Flag Report? 12.2 How Do I Run the E-Journal Report? 13.1 What Are Cashier Permissions? 13.2 What Are Department Fields? 13.3 What Are Item Setup Fields? 13.4 What Are Auto-Field Change Fields? 13.5 What Are House Account Customer File Fields? 13.6 What Files Should Be Sent to the Register? 13.7 How Do I Login to the Pacific Pride Marketer?